Brandon Barnes was drafted by the Astros in the 6th round of the 2005 draft. Since the draft, Barnes has had his fair share of ups and downs, however, he was able to establish himself as a Major League Baseball player this past season. But his road to the big leagues wasn’t an easy one. Playing both football and baseball in high school, Barnes received scholarship offers to play football, but they fell through, leading him to the decision to be a baseball walk on at junior college. Getting drafted in 2005, Barnes began his professional baseball career, but it would be 2012 before he would finally make it to the Majors, despite posting solid numbers in the minors. Barnes had a good 2012 (partial) season with the Astros, playing in 43 games to end the year, however, it wasn’t until the 2013 season that he was fully given the opportunity to show off his ability to play on the big league level, and play well. In 136 games, Barnes hit 8 home runs and drove in 41 runs, batting .240, including a cycle in the middle part of the season, as well as making several outstanding catches in the outfield throughout the year. If Barnes can continue to put together the same type of caliber seasons, both offensively and defensively, he should find himself roaming the outfield in Houston for many years to come. From the stories my parents have told me, I was swinging a bat and throwing a ball at the age of two, but I remember becoming interested when I was about four. I would say with no doubt that my grandfather was my biggest baseball influence growing up. He was always teaching me something new. Growing up an Angels fan, I was always a huge fan of Jim Edmonds. I just loved the way he played. He was one of the best center fielders in the game, and he was always flying around the outfield. 3.) While in school, you played both football and baseball. What ultimately made you choose baseball? My senior year of High School I actually quit baseball to concentrate more on football. I had some scholarship offers from some Division 1 schools, so I wanted to put all my time and effort into my school work and football. At the end of my senior year my scholarships were given to other players, and I was devastated, but I knew God had a plan. I decided to follow God’s path for me and walk on at Cypress Junior College to pursue baseball. 4.) You were drafted by the Astros in the 6th round of the 2005 draft. What was that process like for you? Where were you when you first found out? Initial thoughts? I really did not know a whole lot about the draft and the draft process. I was just told to tune in on the computer and that I could possibly be drafted. I was at my Grandfather’s house listening on the computer. I just remember waiting and waiting, and just wanting to leave to go workout. I didn’t think I was getting drafted as high as I did. It was another blessing from God on his path for me. I was so happy, and at the same time had no idea what was going to happen next. I think I was a little overwhelmed. 5.) You spent eight seasons in the minors before finally making your MLB debut in the late part of 2012. Did it become discouraging at any point, wanting to get to the majors while being told that you never would? Did being told you wouldn’t ever make it add even more emotion to the experience during your debut? Spending eight years in the minors was like a roller coaster for me. There were a lot of ups and downs, but with a little more downs than ups. There were a couple times where I just wanted to call it quits and go back and try to play football. My motivation was the people that told me I wasn’t going to make it. I was going to prove them all wrong and at the same time prove all the people that supported me right. There were a lot of emotions the day of my debut but no better feeling than seeing my wife and daughter in the stands. All the hard work and sacrifices that my wife had made so that I can play baseball had just overcome me, and I was so happy. 6.) This season, in addition to a fairly good offensive year, you made a lot of great plays in the outfield. Do you take more pride in your defensive game or your offensive game? What do you do to work on both? I take a lot of pride in both parts of my game, [but] defense comes a lot more natural. I think I actually work harder on my offense. I work extremely hard on both making sure that I can help the team win on both sides. During the season I shag like it’s a real game, and I have a strict routine for my offense that I try and stick to. 7.) 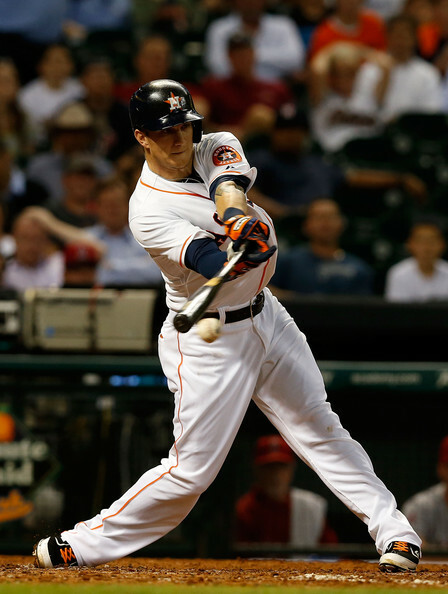 Back in July you hit for just the eighth cycle in Astros history. What was going through your head in your final at-bat, knowing you needed a double to complete the cycle? Would you consider that your most memorable moment of your career thus far? Going into that at-bat, I was aware of what was going on; just not trying to put pressure on myself. I was singing my walk-up song trying to stay calm and trick my mind. I would have to say that is one of the most memorable moments of my career for sure. In 2013 I was able to show all the aspects of my game and prove that I can play in the big leagues. My goals for 2014 are to come back a more complete player, to have a better approach at the plate and to be a little faster for the base paths and defense. Favorite TV show is ‘Dexter’ and favorite food is fish and sushi. My advice would be to practice as much as possible but have fun every second. This is a fun game, not a nine to five job. Try to learn something new about the game everyday and never give up. Don’t listen to the people that tell you that you will never make it. Big thanks to Brandon Barnes for taking the time to answer my questions.